The opportunity to immerse myself in human experience at the confluence of urban space, where vastly differing cultural influences meet, and how this shapes a city physically and experientially is what intrigues me as an architect. It also heightened my sense of anticipation as I landed in Cape Town, my first journey to the African continent, to spend time in the host city for seven 2010 World Cup matches. Exacerbating the legacy of apartheid and more recent gentrification trends, in 2010 FIFA commandeered the rare and therefore crucial major public spaces in Cape Town, a process that reinforced economic segregation and presented a generic, pallid, and global tourist image. For instance, the Grand Parade in the heart of the central city —where 100,000 people congregated to hear Nelson Mandela’s first speech upon his release from prison in 1990 — was the site of the official Fan Fest during the World Cup. 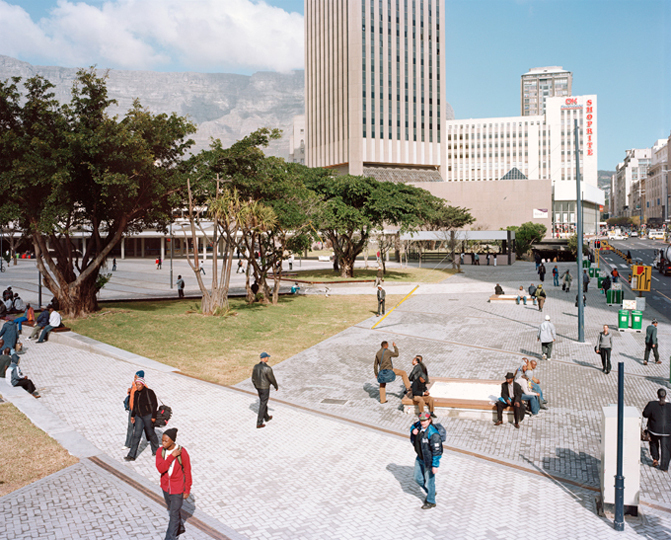 Despite well-meaning attempts by the local authorities to remake urban space in a way that transcend old and new social divisions, the 2010 World Cup in Cape Town inadvertently reproduced patterns of injustice and exclusion. Like other host cities, Cape Town adopted a new set of World Cup By-Laws contained in the Special Measures Act passed by Parliament in 2006. As per FIFA mandates, certain key public spaces within the city were categorized as “Controlled Access sites” or “Exclusion Zones.” The former definition applied to, among others, stadiums, Fan Fests, hotels used by World Cup teams and FIFA delegates, practice facilities, and public viewing areas. “Exclusion Zones” were designated areas within a one kilometer (0.6 mile) radius from the perimeter of a venue or stadium. Inside these FIFA “sites” and “zones,” special rules regulated advertisements and signage; street trading and vending; beautification and acceptable decorum; and traffic controls and road closures. South African security forces laws rigorously policed these FIFA spaces and the government set up a special court for the duration of the tournament to adjudicate violations and infringements of these and other laws. This grim story stood in stark juxtaposition to the upgrading of “global” Cape Town’s transport infrastructure for the benefit of middle-class residents and World Cup tourists. The main train station, the airport, and the N2 highway were significantly revamped, an example of how the World Cup served as a catalyst for government-funded projects. Empowered by the temporary FIFA By-Laws, these public spaces and transport links were saturated with World Cup advertising, effectively creating an alternate experience for football tourists. This kind of urban development also exposed the primacy of FIFA’s self-interest over the needs and wants of the majority of the city’s population, as well as the South African authorities’ willingness to play along with the Swiss-based organization. This exclusionary, even discriminatory process decisively shaped Cape Town’s World Cup experience and raised troubling questions about the effectiveness of the “Football for Hope” program, FIFA’s principal corporate social responsibility initiative. Cape Town Train Station refurbished by architect Mokena Makeka. The FIFA Football for Hope center in Khayelitsha consists of a small community building with changing rooms, office spaces and a caretaker’s flat, which fronts onto a non-regulation size football pitch with an artificial surface. Landscaped surroundings facilitate public spectatorship. Designed by ARG Design, a local architectural firm, and built by Architecture for Humanity, an American NGO, the center does not opt for South African vernacular architecture of barricading itself in; there are no fences surrounding the centre, and the caretaker flat allows for a degree of self-policing. 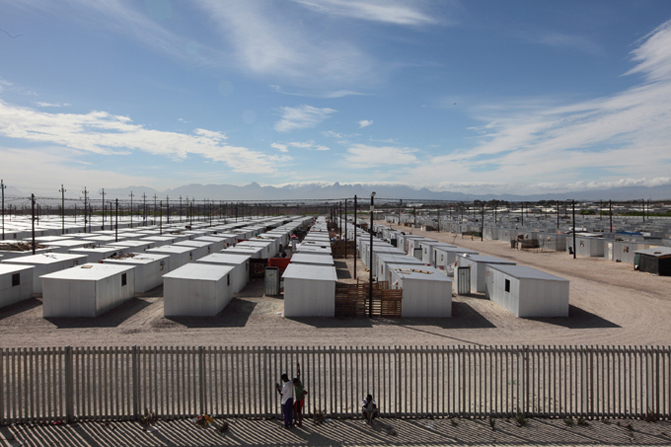 Khayelitsha’s Football for Hope centre stands at one end of an open space, with a residential cul-de-sac on the other. The layout allows a new pedestrian footpath to pick up where the cul-de-sac terminates, linking through to the opposite end of the site where another community building erected by the Violence Prevention through Urban Upgrading sits. This formerly abandoned, poorly lit, and dangerous tract of land now physically re-connects spaces in this part of Harare. I visited the Centre to take some photographs for Architecture for Humanity. Children ran around the landscaped areas under the watchful eye of their parents sitting in the shade of the pergola, while the scheduled activities carried on. When a football game was played on the artificial pitch, it felt like the entire community congregated as spectators, standing on the sidelines and indicating their support by drumming on the perimeter boards of the pitch. It seemed like a contemporary expression of a long established tradition for the community, too serendipitous to be impromptu, even though I was informed that it was the very first game to be played at the Centre. Under the World Cup By-Laws, the Football for Hope Center was designated as a “Controlled Access Site” on the day of its official inauguration, coinciding with the festivities surrounding the World Cup draw in December 2009. I attended this opening and was struck by the unusually visible police presence on the streets of Khayelitsha. The convivial, communal atmosphere that I experienced in my earlier visit was noticeably absent. A ten-foot high perimeter fence now enveloped the Centre and private security guards controlled access and checked tickets at the entrance. Temporary tiered seating and white VIP marquees flanked either side of the center, and from a presentation podium, FIFA President Sepp Blatter delivered his “Football for Hope” homily. These incongruous structural elements blocked out views of both the playing space and the gritty neighborhood surrounding it. Local residents and police officers came together on the edges of the controlled area, finding a spot on the embankments to peer over the perimeter fence. The logos of FIFA’s corporate partners adorned the advertising boards surrounding the pitch. These corporate logos would become a permanent feature of this center and of projected Football for Hope centers in Namibia, Lesotho, Kenya, Rwanda, Ghana, Mali, and other African nations. 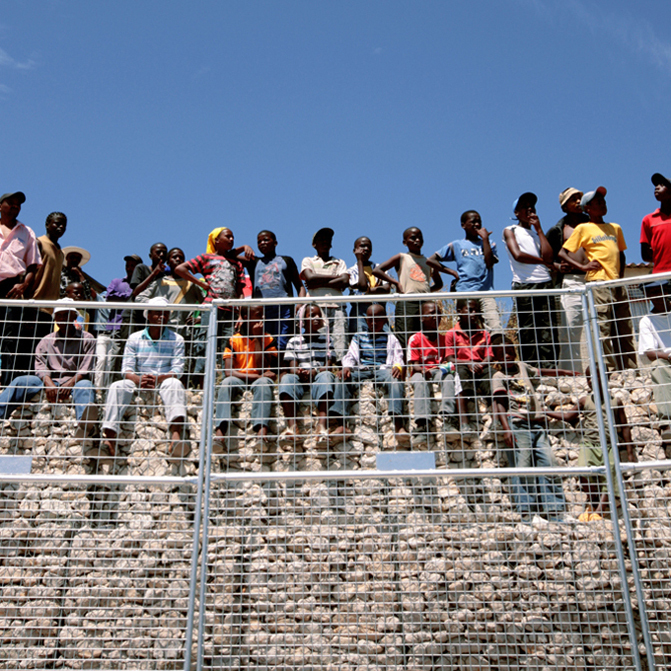 The meeting of the FIFA and Khayelitsha worlds at the perimeter fence revealed some of the contradictions of World Cup development. This exclusive FIFA celebration was happening in a tough place whose origins lay in residential segregation and racial oppression. It revealed the deeper motives behind this social responsibility program. On the one hand, this project embraced the tenets of inclusiveness in its urban design, but on the other hand rendered it temporarily exclusive for a public relations exercise. Such processes of inclusion and exclusion at the Football for Hope in Khayelitsha can be compared with those observed at the FIFA Fan Fest at the Grand Parade in the city center during the World Cup. FIFA Football for Hope center in Khayelitsha. Center during the official opening. The Grand Parade was the epicenter for Cape Town’s World Cup celebrations. 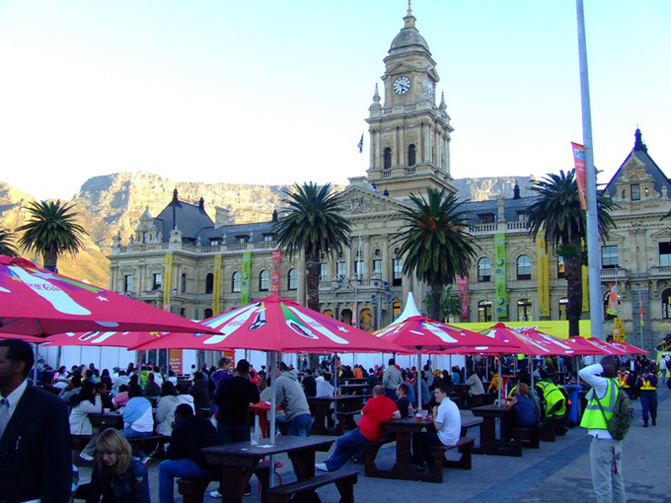 Surrounded on three sides by City Hall, the Castle of Good Hope, and the Cape Town railway station, extensive refurbishment for the World Cup made it possible for the general public to watch the games on a huge TV screen. During the tournament, I walked by the entrance to the Fan Fest zone on my way to work in the morning as revelers congregated in multicolored regalia with the cacophony of vuvuzelas reverberating in the streets. Men and women of different racial and ethnic backgrounds stood in line at the entrance (the Fan Fest was surrounded by a temporary fence), slowly filing into the open space with tiered seating facing the large screen. The atmosphere at the Grand Parade was lively. The convergence of tourists and Capetonians in joint celebration within this space contrasted starkly with the stymied, exclusive controls experienced at the opening of the Football for Hope centre in Khayelitsha. But FIFA’s usual restrictions on conduct, use, and access shaped people’s experiences at the Fan Fest. 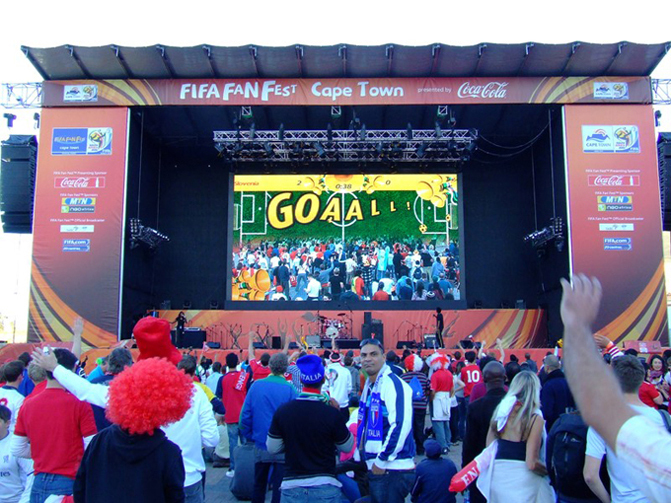 At the Grand Parade and near the Cape Town stadium at Green Point, fans were inundated by FIFA-approved products, including food catered by Headline Leisure, the company contracted to supply FIFA spaces. 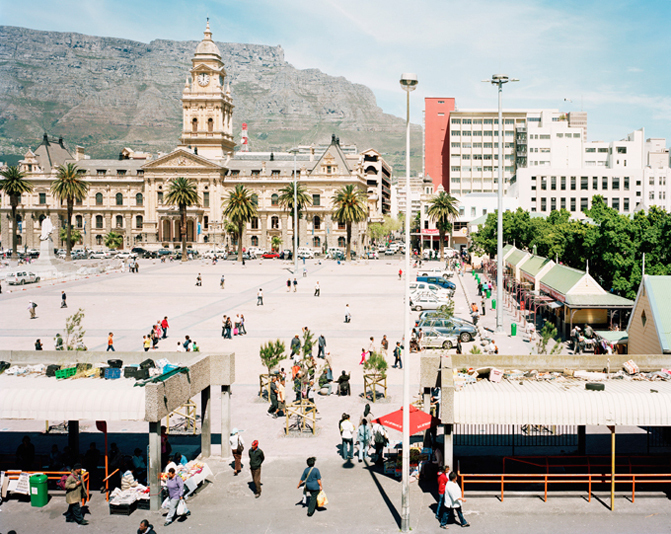 Gone were Cape Town’s market stalls and their aromatic haze. As a result of such exclusionary policies and procedures, some Cape Town vendors claimed to have lost 20,000 rands ($3,400) during the World Cup. Considering South Africa’s minimum subsistence level is $2,300 per year, the suggested potential loss of personal revenue is significant. Seating area at the Fan Fest. Given that FIFA will stage the World Cup in Brazil in 2014, can Cape Town’s experience provide some lessons for future host nations to counter this movement toward increasingly generic urban experiences? A starting point is the creation of a more flexible framework by FIFA that adapts to the local context more suitably without the need for exclusion and marginalization. Berlin is not the same city as Cape Town (or Rio de Janeiro or Moscow), so FIFA’s rules, guidelines, By-Laws, and social responsibility programs should be tailored to suit local needs and conditions, and not the other way around. FIFA needs to be less parasitic and more altruistic. In the example of South Africa’s informal street traders, they should have been permitted to sell their wares within the FIFA zones. Perhaps a compromise might have forced traders to acquire and sell some FIFA sanctioned stock. 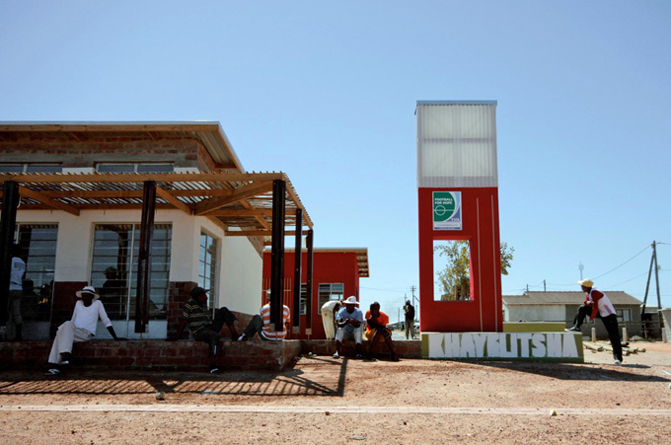 While the Football for Hope centre in Khayelitsha addresses some important public health and gender issues in the townships, it was still narrowly focused on football and its long-term sustainability remains to be seen. Considering that more than 40 billion Rand ($6 billion)  of public funds went into stadium construction and infrastructure projects and that FIFA earned $3.2 billion tax free from the 2010 World Cup , it seems reasonable to expect that in the future national governments can put pressure on FIFA to pay for more of the hosting costs and help attract foreign investment. Since contemporary world cities’ economic strategies and marketing campaigns often rely on hosting major sporting events, it is important to question hosting agreements and by-laws that empower multi-national corporations to appropriate public space. By doing so, host cities and nations can make mega-events more inclusive, equitable, and locally sustainable. 1. 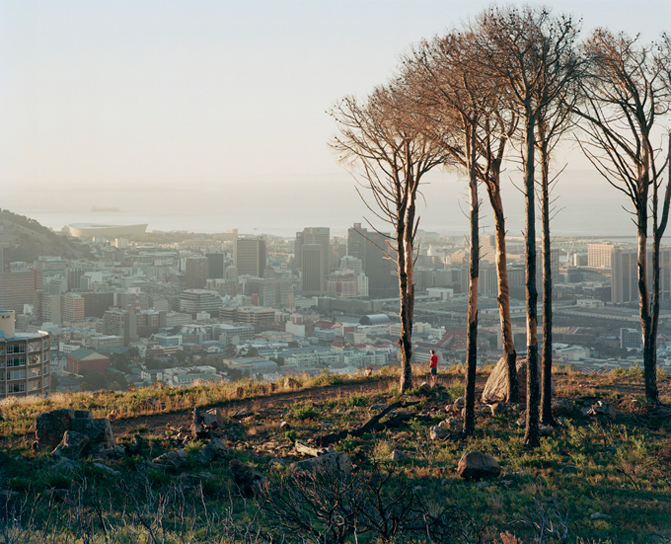 See Christopher Saunders, “Cape Town and New Orleans,” Safundi 1:1 (2000): 1-6. 2. Vivian Bickford-Smith, Elizabeth van Heyningen, Nigel Worden, Cape Town in the Twentieth Century: An Illustrated Social History (Claremont: David Philip, 1999), 7. 3. Christoph Haferburgm Theresa Golka and Marie Selter, “Public viewing areas: Urban interventions in the context of mega-events,” in Udesh Pillay, Richard Tomlinson, Orli Bass, eds., Development and Dreams. The Urban Legacy of the 2010 Football World Cup (Pretoria: HSRC Press, 2009), 174-199. 4. For more details, see Ashraf Cassiem, Western Cape Anti-Eviction Campaign, speech at Rhodes University’s teach-in on the 2010 World Cup, Grahamstown, September 2010: http://www.youtube.com/watch?v=Nf0SBMGJeQU (last accessed August 5, 2011). 5. For more information ,see Grassroot Soccer, “Football For Hope Centre Opens Its Doors To Khayelitsha And The World,” http://www.grassrootsoccer.org/2009/12/08/football-for-hope-center-opens-its-doors-to-khayelitsha-and-the-world/ (accessed 5 August 2011); Architecture for Humanity, “Khayelitsha Football for Hope Centre,” [not dated] http://architectureforhumanity.org/node/825 (accessed 5 August 2011); and FIFA.com, “Opening of first Football for Hope Centre heralds a new dawn for Khayelitsha,” 5 December 2009 http://www.fifa.com/aboutfifa/socialresponsibility/news/newsid=1144491/index.html (last accessed 5 August 2011). 6. Football for Hope centers are planned for Alexandra, in the northern suburbs of Johannesburg, as well as in Mokopane in Limpopo. Killian Doherty is an architect working and lecturing in Rwanda. A member of General Architecture Collaborative, his research interests lie within the exploration of fragmented sites, settlements & cities at specific thresholds of racial, ethnic or religious conflict.